Product #20867 | SKU SAMBT3 | 0.0 (no ratings yet) Thanks for your rating! Features the ability to connect to your smartphone, laptop or tablet. The stereo pair of MediaOne BT3 Two-Way Active 3" Bluetooth Monitors features the ability to connect to your smartphone, laptop or tablet. Each monitor houses a 3" copolymer woofer and a 1" silk dome tweeter, and can produce 15 watts of RMS power- 30 watts peak. 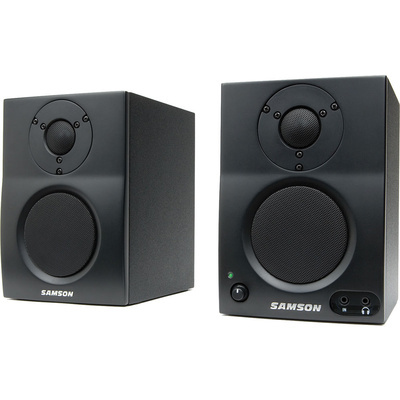 The rear-vented, precision-tuned port enclosures are constructed of MDF and finished in a black satin vinyl covering with matching metal grilles. Bluetooth connectivity means you can listen to music, videos and other media playback through the MediaOne BT3 monitors without wires. The Bluetooth pairing button is on the active speaker's rear control panel, along with stereo RCA inputs. The front panel features level control, as well as a headphone output and a 1/8" (3.5mm) stereo input.